Dinosaur Comics - March 2nd, 2010 - awesome fun times! March 2nd, 2010: The cryptogram in yesterday's comic has not yet been solved, so I've upped the prize to two shirts! Here's a link to Joel's puzzle-solving tool he's released - awesome! And finally here's a link to a picture of Samantha, whom USA Today informs me is working on video games at the best-rated video game school in the States, AND who has excellent taste in clothing. Thanks Samantha!! 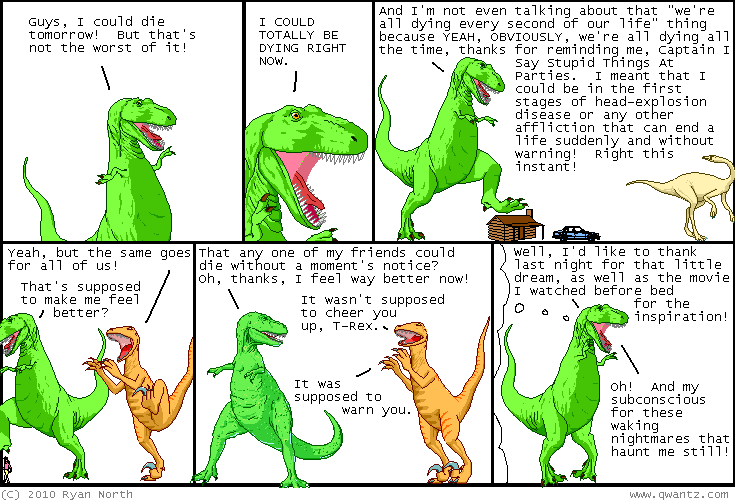 One year ago today: t-rex is talking into his audio diary. or to his mirror. or to morris?